The VIP area allows you to provide a branded area that your own clients can use in order to view their mobile survey results. Your clients can view the results by simply opening the provided URL or you can secure the data using a password. Only approved results will be displayed here, so you can also pre-filter unsuitable responses. Please note: VIP areas and VIP Report are only available to Premium clients. Display the results for all forms within the branch. Setting is in the Profile page > Edit any branch. There is a section called “VIP Area”. Just tick the checkbox and you will see the url address and the password required to access data. 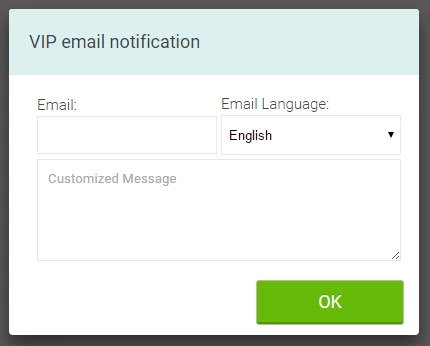 There is also a mail icon, where you can send an already prepared email to the client that will contain the access URL and password. You can also include a customised message. The area will be activated and an email sent when you click the “Update” button. From then on, your client will see all forms that have at least one approved response. And they will see only approved responses within these forms. Displays results for one specific form. This is similar to the VIP area, but displays only results from one form. Just edit the form, click on the “Advanced” icon and then click on the “Enable VIP Report” checkbox. You will see the URL under which the form results then appear. The password is optional here. If you do not specify any, then the results will be displayed to anybody that will know the URL - Please note:we recommend to set a password if your data is to remain strictly private. Remember to save the form. When your client visits the URL, they will see all approved responses within these forms. Do you want the VIP Area to appear on your website? You can just add this using the iFrame. You do not need to install any special server attributes and this can be done in a few minutes - you can then pass this info below to your website developer if you get stuck. Create a new page in your website and add the following part of the code into your page content. You can modify the width and height based on your website needs. Simply update the src link to any VIP Area needed (find those src in the “VIP Area” when editing the brandings or “VIP Section” on Form Builder).